Two orangutans jump for some yummy, juicy mangoes and the next thing they know, Thump! Bump! Crash!—they fall into a gooey, gummy mess and start rolling through the jungle, completely oranguTANGLED! Soon they are passing by a nosy boar, and then he’s quickly swept up, not to mention the frog, the yak…and even a tiger. How will they ever get untangled? 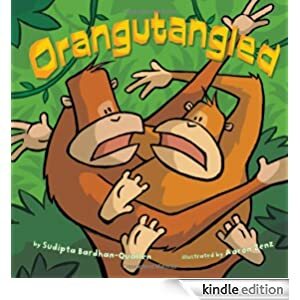 Bursting with fun, the bold illustrations and rhyming text filled with sound words make this the perfect read-aloud story for little ones ages 3-7. Buy this Kindle Fire book for only 99 cents today.